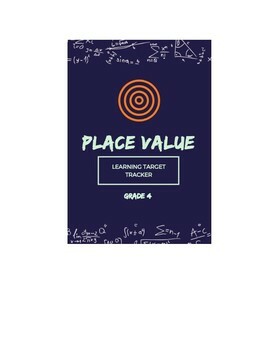 This Learning Target Tracker allows your students to document their level of understanding for each "I Can" Learning Target related to 4th Grade Place Value Standards. Great way for students to track their progress and take ownership of their learning. Click on the link once you download the document, and it will force you to make a copy. It will then be in your Google Drive! You can push out on Google Classroom or print individual copies. 1.1 I can describe and compare the values of a digit. 1.2 I can read and write numbers in standard, word, and expanded forms through the hundred thousands. 1.3 I can compare and order numbers through the hundred thousands. 1.4 I can round numbers to any place value.